Here at Subaru of San Bernardino we love to hear our customer's feedback! If you have any questions or comments for us, please let us know. You can fill out our convenient online Inquiry Form and we'll happily get back to you as soon as possible. Whether you have questions regarding the new car buying process, are wondering if your Subaru is due for maintenance, or you have any concerns, our friendly and knowledgeable customer service representatives are here to help. We can answer any of your questions using your preferred method of contact, either through email, phone, or in person. 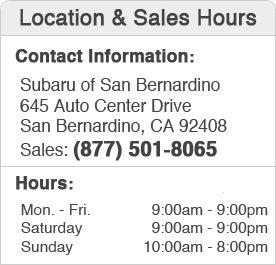 Our Subaru dealership proudly serves the greater Rancho Cucamonga, Ontario, Fontana and Riverside areas. We look forward to hearing from you!